Hand made modular wine rack of beautiful design and construction. Manufactured from high quality Canadian Pine wood. Our stackable wine rack is very solid yet very affordable. The wood we use is of superior quality over other wine racks found on Amazon. They are smooth yet durable material. You have the options to select these racks ranging from 24 bottles 4 rows all the way up to 72 bottles 12 rows. Based on your wine bottle capacity requirements. The pictures tell you everything, our stackable modular wine racks are the most versatile and easily assembled racking system available. We have multiple sizes of racks and lengths to accommodate your wine capacity as well as your floor space. We have racks ranging from 24 bottles to 144 bottles. All different capacity and lengths, to fully utilize your floor spacing. Product Features: *Improved 2017 Model. Sturdier design, wobble free, interlocking joints for maximum stability. * Made from Canadian Pinewood. Very classy and elegant yet solid furniture grade wood. * No details overlooked. Each shelves have hand beveled edges, very smooth rounded edges for maximum bottle/label safety. * Quality of thee wood means that they will not dent, turn yellow, or fade. Much higher quality then other wine racks on Amazon. * Assembles without any tools or hardware. Very easy to assemble, attaches together like Lego blocks. *Unfinished wood is already sealed but will allow you the option to stain, paint, or varnish to match any decor you might have. * Will hold all standard 750ml bottles- Bordeaux, Burgundy, Cabernet and most Champagne style 750ml wine bottles. As well as Pinot Noir. - No tools are required, pieces simply fit together like lego blocks and locks in place. 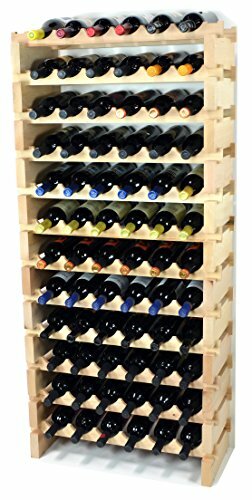 - Stackable, 6 bottles wide by 12 shelves high racks, giving you a total storage of 72 bottles.